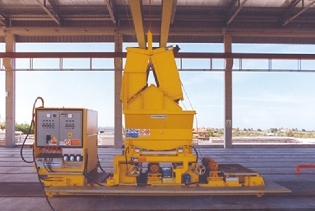 Prestressed concrete element production is made up of different intermediate phases, each one accomplished by a dedicated machine or piece of equipment For that reason, NORDIMPIANTI has developed a large range of machines and equipment able to work in every phase of the production and to suit the individual elements being produced. NORDIMPIANTI offers customised solutions for the easy and efficient production of every type of concrete element. Build quality Our machines are designed for long life using materials and components from leading manufacturers from all over the world. Reliability Our products have a proven international reputation. They are the preferred choice for many leading companies who need and expect the machines to work hard and with the minimum of downtime. Quick and easy maintenance It takes just a few simple steps because each operation has been studied and engineered thoroughly. Safety Our products meet the strictest standards for the safety of workers and of the workplace.